Your audience does not need your ideas. Your audience is exposed to plenty of ideas. Everywhere they turn online and offline, they are bombarded with ideas. Ideas, ideas, ideas. Mostly filler and fluff. Think about yourself. Do you need any more ideas to consume and consider? What you need are someone’s best ideas. And what your audience needs — in fact, all that your audience needs — are your best ideas. And you should invest more time distributing these premium ideas further and wider, in different ways and in different places. You shouldn’t simply hit Publish and then run to the next idea. This way you can meet more of your current audience members where they are and you increase the likelihood of reaching potential audience members with your best work. Given my responsibilities here at Rainmaker Digital, and being a new dad, I don’t have a ton of extra capacity for side projects. So when I do have an idea worth sharing over at The Assembly Call, I want to maximize the impact and distribution of that good idea. I can’t afford to spin my wheels. This is why I’ve shifted my strategy and begun taking one well-thought-out idea and repurposing it into several different types of content, distributed in many different places. The idea is given birth in a blog post. Why? Because I do my best thinking when I’m writing. Writing forces me to clarify my thoughts in a way that I’m never able to by simply ruminating, or even talking. I need to sit down, think, write, edit, think a little more, edit a little more, and chisel the idea from rough stone into something smooth and polished. A lot of the fluff, filler, clutter, and crap gets removed, and then I feel much more comfortable turning the idea loose in the world. You may be different. You may thrive working it all out in your head. You may find that you clarify your ideas best by talking them out. I urge you to learn what works best for you and follow it. But for me, it starts with writing. Hence why I began a blogging series titled “3-Point Shot” — where, basically, I take a topic of interest to IU basketball fans and come up with three useful observations about it. Simple. Consistent. Repeatable. Sometimes I know what the observations will be before I start writing. But usually the process of conducting basic research, and then synthesizing it into three clearly articulated ideas, reveals new insights that are useful to me and, in turn, to my audience. I write the first draft. Sometimes I rewrite or rearrange parts. Then I edit and proofread. Soon thereafter I hit Publish. The entire process usually takes 60–75 minutes. Now I have a blog post, usually in the 1,000–1,250 word vicinity, that I can distribute via social media, use to attract search traffic, and send to our email list. One piece. One format. A few distribution channels. All done? Hardly. I’m actually just getting started. The beautiful part of this strategy is that the most difficult and time-intensive part is now done. I developed a high-quality idea — it’s not just something I slapped together in 15 minutes as a cheap traffic grab. Next, it’s time to leverage this fully-formed idea into a blitzkrieg of distribution. Keep in mind as we go through this example that the specific steps and channels that work for me over at The Assembly Call may not necessarily be the steps that you need to take. That site is built around a podcast, and we’re also trying to grow our YouTube audience. Therefore, getting content out to our podcast audience and publishing more content to our YouTube channel are priorities. That might not be true for you. But the big idea that I’m describing here — combining the power of quality over quantity with repurposing and smart, widespread distribution — will work for you. Just take the basic principles and apply them to your situation. The next basic principle for me is this: turn the blog post into a podcast episode … and there just so happens to be a way that I can do that while simultaneously creating a video version too. Score! When time is of the essence (and when isn’t it? ), you have to take any chance you can to work smarter, not harder. Open up my Assembly Call episode template in GarageBand, so I can record locally. Create a YouTube Live Event to broadcast the recording live. Open up the blog post in a web browser, so I have it ready for reference. Hit Record in GarageBand, hit Start Broadcast on the YouTube Live Event, welcome the audience, and start reading the blog post. From time to time while reading, I’ll interject something extra — the kind of comment that might have been a footnote to the written piece. But for the most part I just read the blog post verbatim, trying to sound as casual and conversational as I can. I was worried when I first starting doing this that our podcast and YouTube audiences wouldn’t be too enthused about this content since it’s just me (without my co-hosts) and I’m basically just reading something they could get on the blog. My worries proved to be unfounded. The response has been unequivocally positive. I’ve received numerous tweets and emails thanking me for finding a way to deliver this written content in the preferred consumption medium for podcast listeners, which make up the majority of our audience. These folks would never get to see or hear the content otherwise. Furthermore, while our blog posts only publish in one place — our blog — we are set up to distribute our podcast episodes far and wide, with only a few button clicks required. One of my favorite bonuses about tweeting out links to podcast episodes over blog posts is that people can consume the content right there in their Twitter feed. Look at this tweet. All someone has to do is hit the play button, and the episode will play right there in the Twitter feed. Less friction, less distance between my audience being intrigued and then actually consuming my content. And here’s the crazy thing … it could be more. The main reasons I don’t do those are a) time and b) because I’d get diminishing returns. I’ve tried to be strategic about investing the limited time and effort resources I have for this project into the channels that will deliver the best and most immediate returns. SlideShare, for example, isn’t going to do much for a sports audience, but it may be a great option for you. Ask yourself if you’re maximizing the distribution of your best ideas. Not your best blog posts, but your best ideas. Because if you have an idea that’s a winner, but it’s only distributed via text as a blog post, then you’re missing out on a wide range of additional attraction options. Can you turn your blog post into an audio recording? Can you then turn that audio recording into a video — even if you just use a fixed image rather than filming yourself (like I do here)? Or, if you have a great podcast episode, can you go the other way and turn it into a blog post? If you already create transcripts for your podcast episodes, this is incredibly simple to do. The bottom line is that rather than focusing on the quantity of the content you publish, you should invest more time in creating fewer, higher quality pieces of content … and then find efficient, scalable ways to distribute these high-quality pieces to as many nooks and crannies of the web as you can. You’ll reach more people with your best ideas in the way they’re most comfortable consuming content. And there’s no better way to build an audience and authority, brick by brick, than that. I love this one, Jerod. So practical, so smart. Great tips. This is something I need to get better at. Repurposing content. You spend all that time creating content, why not repurpose it in as many places as possible! I don’t podcast, but I could probably turn some of my best posts into videos! Also need to look at different channels. I like the idea of this strategy, get your best work in front of more people! Yep — that’s the idea Chris. Challenge yourself to do more with the best ideas you’ve already published. That is a clever idea. I never thought that but Repurposing old content on a new platform can attract more visitors. Sometimes, it becomes really hard to get a new idea but this repurposing thing can help us AT THAT BAD TIME. I wish all Copyblogger blog posts were available as audio. 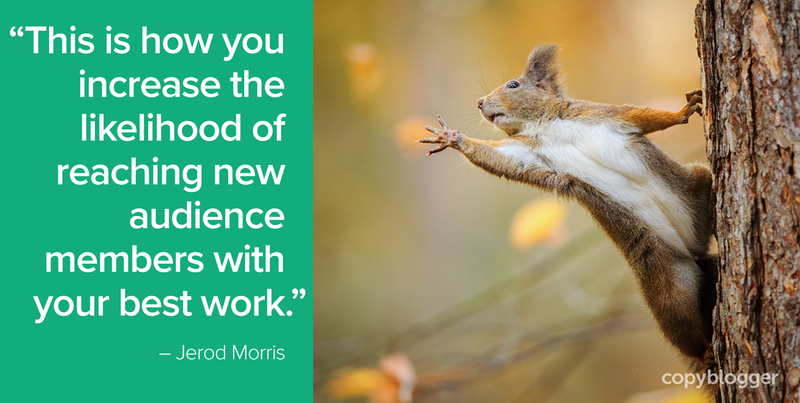 Thank you for this very insightful article, Jerod Morris! One of my biggest takeaways from this discussion is that The blog post becomes a podcast episode (and video!). Turn one quality blog post into a traffic and attention engine I believe is the key to SEO going forward. I still see many marketers who are stuck in the SERPS and getting nowhere. They keep tossing more and more links to their pages but they don’t budge, but most of these folks have little to no social presence. So my biggest revelation here is social media and podcast is only becoming more and more important to rankings in the search engines as time goes by and those who don’t get that, will be left behind by their competitors. Great ! Never thought of Repurposing old content, It sometimes gets very difficult to get new ideas to write epic content, so turning old content to Audio or video can certainly help us reach wider audience. It could be big for lazy persons like me. Thanks a lot for the tips Jerod ! Thanks Jarod, I have recently started to video the reading of my blogpost. It’s early days, but my blog is focused on helping people with Mental Health struggles. Its been my experience that for many they often lack concentration, literacy skills and also need to see the non-verbals that might be missed in text only. So I am hoping that have this other medium might fill a need. Integrating repurposing into your content strategy is an economical way to make the most of your great content creation efforts. It helps in lowering costs, expanding audience reach and providing an opportunity to go deeper and develop a better understanding of your target persona on different channels. This is a great, informative post, Jerod! Like you say, if you believe in your article/post enough, then there is absolutely no reason that you cant repurpose it in as many suitable places/ways as possible. Agree that my blog readers are already bombarded with ideas and what I can do is give something that actually add value to their knowledge and ideas. Furthermore, the idea of distributing a single piece of content to as many platforms as I can is great. One blog post distributed to 100k visitors is better than 10 posts distributed to only 1k visitors. Thank you for making re-purposing painfully obvious. I thought I knew about this, but now I REALLY get it. One thing I take away from this Jarod is where you mention, no more ideas. Just give them our “best” ideas. I agree. After all, new ideas are not really so new. They are too many times something someone simply has not yet read. I must say your time management is the best of all. And yes converting a blog post into a Audio and Podcast can increase your traffic on blogs multi-fold. Instead of working on many ideas one should focus on a single idea and make it successful by doing everything it take to reach the goal. This is great because writing a 1200 word blog post can be daunting, but if it means you’ll get 10-20 pieces of content out of it like pins, tweets, posts, then it’s worth the effort. I have not done video or podcasts, but I can see where the blog could be your show notes. It is a skill to repurpose content. Will try this for sure. Thanks for the information!